This past Friday, without planning, I had the unique pleasure of introducing four awesome patients that had 8 total hip replacements between them. It was an inspiring moment to share their instant connection and their common passion for staying active and healthy. In my 29 years of being a Physical Therapist I have treated hundreds of patients with total hip joint replacements. However, throughout my career I have taken care of only two patients who elected to have both hips replaced at the same time. Adee Hendler had both of her hips replaced at HSS in 2007 and has been a loyal client ever since. I have seen her through all kinds of aches and pains, and our lasting relationship has been based on maintaining a healthy lifestyle, and remaining strong and balanced to keep up with her grandkids. Charlotte Francis had both of her hips replaced at HSS this past August. Only 54 years old, Charlotte is a recently retired NY State trooper. She exemplifies a tough, and hard working patient and within 8 weeks has already gotten back to her passion of refereeing basketball and volleyball. Adee and Charlotte are both wonderful patients and unique in my professional career so it was with great joy that I had the opportunity to introduce them to each other. 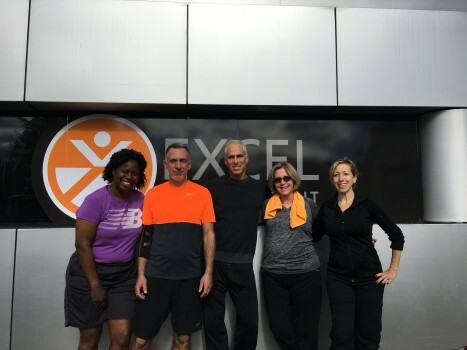 At the same moment that I was introducing them I realized that my patient Steven Holtz and one of Excel’s Pilates instructors Marjorie Waller were exercising in the gym as well. Marjorie had her first hip replacement in 2015 and her second hip replacement four weeks ago. Remarkably, Marjorie was back at work teaching her reformer classes 10 days after surgery and aspires to share her experience and insights to help other total hip patients through Pilates. Steven Holtz has been a client and patient of mine for over 10 years and I consider him a friend as well as a client. Steven, only 54 years old, had his first hip replacement in 2010 followed by his second hip in 2015. I’ve also seen him through a surgically repaired distal biceps tendon as well as a shoulder labral repair. So, on this random Friday it was with great joy and pride that I realized here in our gym were four amazing people with 8 total hip replacements between them. Each one of them representing this new age of what total joint replacement can mean, and how Excel is uniquely qualified to help them get back to an active lifestyle.